Zinc (Zn) is an abundant metal found in Earth’s crust with myriad industrial and biological uses. At room temperature zinc is brittle and blue-white in color, but can be polished to a bright finish. A base metal, zinc is primarily used in order to galvanize steel, a process to protect the metal against unwanted corrosion. But alloys of zinc, including brass, are vital to a wide range of applications, from corrosion resistant marine components to musical instruments. Toughness: Pure zinc has low toughness and is generally brittle, but zinc alloys generally have high impact strength compared to other die casting alloys. Ductility: Between 212-302 oF zinc becomes ductile and malleable, but at elevated temperatures reverts to a brittle state. Again, zinc alloys greatly improve on this property over the pure metal, allowing more complex fabrication methods to be used. Man-made zinc alloy products have been reliably dated as far back as 500 BC, and zinc was first intentionally added to copper to form brass around 200-300 BC. Brass supplemented bronze during the Roman Empire in the manufacture of coins, weapons, and art, and remained the chief use of zinc until 1746 when Andreas Sigismund Marggraf knowingly isolated the pure element. Because he carefully described his process and how it worked, zinc was soon commercially available. Alessandro Volta created the first battery in 1800 using copper and zinc plates, ushering in a new era of electrical knowledge. By 1837, Stanislas Sorel has named his new process of zinc-plating, galvanization, after Luigi Galvani, who had discovered the animating effect of electricity while autopsying frogs. Galvanization, a form of cathodic protection, can protect a wide variety of metals and is now the primary industrial application of pure zinc. Zinc is primarily extracted from ore containing zinc sulfide, zinc blende or sphalerite. The countries mining and producing the most refined zinc, in descending order, are China, Peru, Australia, the United States, and Canada. According to the U.S. Geological Survey, about 13.4 million metric tons of zinc in concentrate was mined in 2014, with China accounting for about 36 percent of the total. According to the International Lead and Zinc Study Group, about 13 million metric tons of zinc were consumed industrially in 2013 in galvanizing, brass and bronze alloys, zinc alloys, chemical production and die casting. Zinc is traded on the LME as "Special High Grade" contracts at 99.995% minimum purity in 25-ton ingots. Brass: 3-45% Zn by weight. Used in musical instruments, valves, and hardware. Nickel silver: 20% Zn by weight. 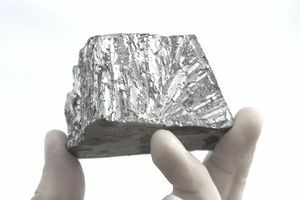 Used for its shiny silver appearance in jewelry, silverware, model train tracks, and musical instruments. Zinc diecasting alloys: >78% by weight. Usually contain small amounts (less than a few percents) of Pb, Sn, Cu, Al, and Mg to improve diecasting characteristics and mechanical properties. Used to make small intricate shapes and suitable for moving parts in machines. The cheapest of these alloys are referred to as pot metal and serve as inexpensive replacements for steel. Zinc is critical for all life on Earth, and used in more than 300 enzymes; zinc deficiency was recognized as a clinical health problem in 1961. The International Zinc Association explains that zinc is critical to proper cellular growth and mitosis, fertility, immune system function, taste and smell, healthy skin and vision. United States pennies are constructed with a zinc core comprising 98% of their weight. The remaining 2% is an electrolytically plated copper coating. The amount of copper used in pennies is subject to change if the US Treasury deems them too expensive to produce. There are as many as two billion zinc-core pennies circulating in the US!